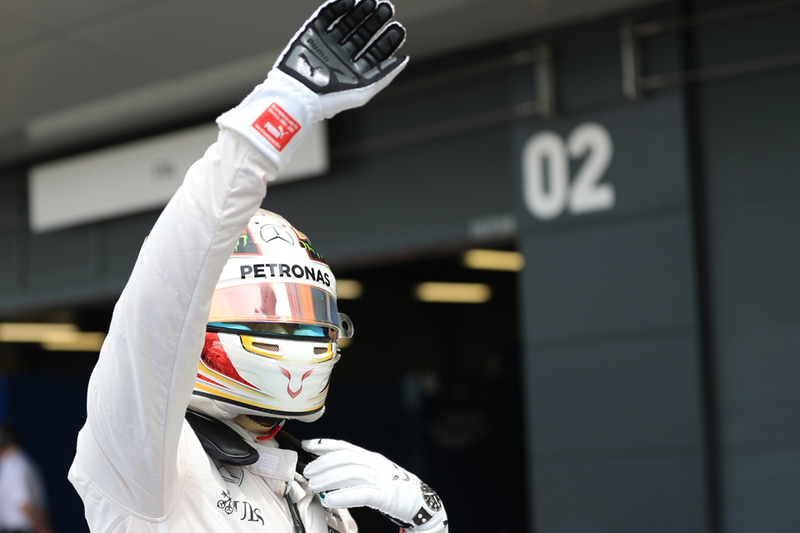 "There is never an easy Grand Prix" said Lewis afterwards, "it just so happens that this was one of the easier [ones]. "Particularly in the rain, when it's very very tough, aquaplaning's possible, and didn't have no problems, no mistakes, no issues, and no one could match my times. When I needed to pull out times I could do it." It can't have been easy, given everything, and in probability Lewis likely was attempting to needle his foe. 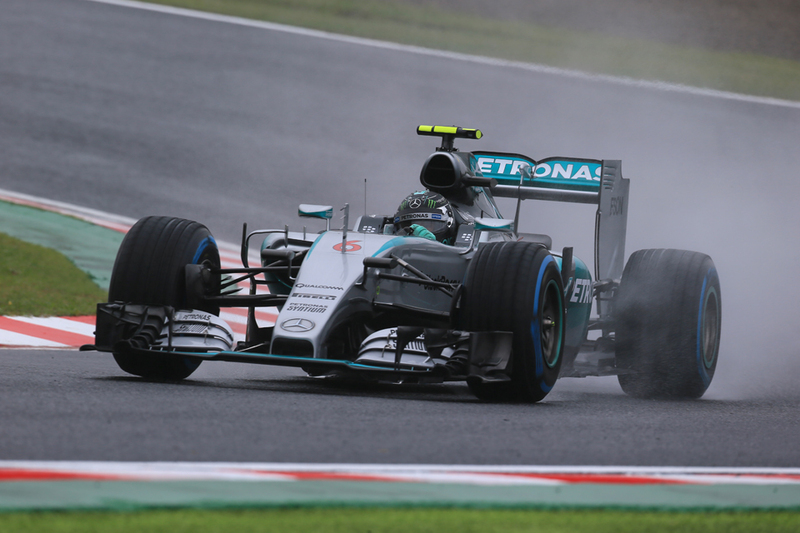 But in fairness to him too his drive to victory in Brazil's rain today was astonishingly free of rancour. And would have been so even were it bone dry. We didn't see so much as a wheel out of line throughout. Nico certainly found it difficult however. "For sure, it was difficult out there, especially with the aquaplaning..." he said. "But Lewis did a good job, the best job out there, he deserved to win...second place for sure I can live with that." Indeed. Thus we go on to Abu Dhabi for the final race in a fortnight to sort this championship battle once and for all. That's not entirely back where we started, as for Nico third place then will be enough. 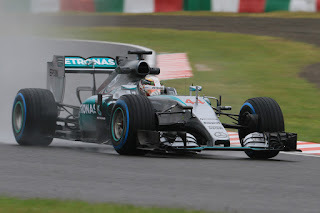 It's odd to think that post-Japan this author among plenty of others thought that while Nico mathematically could follow Lewis home everywhere to take the honours he wouldn't be advised to aim for that, as in this game too much can disrupt you. But still, and while he has insisted throughout it's not been his aim, he remains precisely on that target. Now Merc has got a 1-2 in the last three, having got just four of them in the previous 17... Not even today disrupted it. Nico will be pleased to have got through this one, surmounting in so doing a rather conspicuous hurdle. The reputation for the unusual of the Yas Marina track that awaits isn't anything like that here at Interlagos, but still such things aren't entirely unheard of there. Ask Fernando Alonso. In fact, don't ask Fernando Alonso. In another familiar theme Max Verstappen wowed us today with amazing pace - searching all over the track karting style for grip - and brave moves, coloured by impeccable judgement. One wonders where he would have ended up had his team not sought to force the issue by putting him on intermediate tyres on lap 43 just as conditions worsened, as by then he'd passed Rosberg with typical chutzpah around the outside of Curva do Sol to take second. He'd have finished there you'd imagine. At least. "Win maybe not, but second was definitely possible" said the basking Max later. "I think we were in quite a safe position in second but sometimes you have to gamble a little bit - that is what we tried today. We got some great overtakes so I am very happy, of course." "It would be good if they could do some good calls in the next race!" Nico added in a similar sense, "I was glad that they tried that." But then again it would have deprived us of a scarcely credible subsequent performance from Max, of in just 15 laps rising from 16th to third by the end, almost literally gobbling up the road and opponents before him. It's worth reiterating that he's something special. Nico, as Max did, oh so nearly had a moment to end his race, with a terrifying sideways slide at the uphill and gently curving and undulating Subida dos Boxes section, with plenty hard to hit on either side. Like Max, somehow he saved it, and continued on his merry way. Aside from this Nico simply stayed out of trouble to get the second place he needed. Rarely if ever did it appear that he had the legs of his team mate out ahead, but he had the constraint to know that he had no need to chase him down. "That's what I'm driving for" Nico added of the title sitting tantalisingly before him, "I want to finish on a high with a win, that would be nice. But of course less than that would be enough". While Lewis continued his other recent theme of doing what he had to too, in his case by winning. 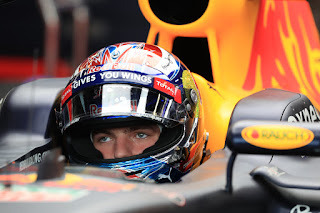 Even Verstappen as outlined admitted he wouldn't have troubled him this time. "I am hunting and all I can do is do what I am doing right now," Hamilton said. 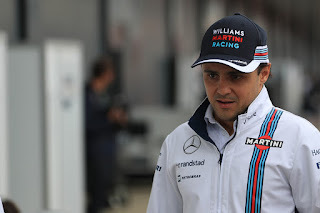 "The team has given me a good car and finally the reliability is really good. Abu Dhabi is a good track for me." As noted the earlier delays today caused no little consternation, though at the first red flag there seemed little to argue with, as at a resumption of green flag racing - after a safety car period brought about by a smash for Marcus Ericsson at the Boxes section, Kimi Raikkonen wrote off his Ferrari in similar style at a similar point with most of the field right behind him and unsighted - somehow they all missed him. Most harrowing of all was that Kimi simply had floated out of control on the straight. The second red flag seemed odd though, given at the time conditions certainly were no worse than before, though some suggested it owed more to an impending storm in the forecast and therefore to not wasting laps and racing time (both of which are finite) circulating behind the safety car. Some wondered too if with Jules Bianchi, litigation and all that the FIA was particularly minded to be cautious. That a car had not long earlier lost it at 180mph in a straight line though may have concentrated minds too. There were as intimated plenty of other fine drives out there in Brazil, once we did get going proper. 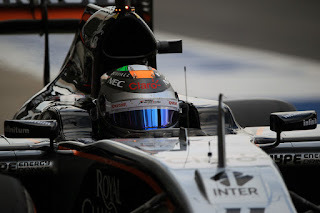 Sergio Perez appeared to be doing his usual trick of being attracted to a podium place like a magnet to metal, helped by being one of a few to make the right move of not pitting prior to the first red flag, when the race is in effect zeroed. But even he had to give best to Max late on and fourth was his lot. Sebastian Vettel got fifth, recovering determinedly after being another to lose it at the Boxes section early on. He didn't hit anything but did end up pointing the wrong way. Carlos Sainz was another to stay out of trouble as well as to have been vaulted up by not pitting before the red flag, and sixth was his eventual reward. While another to do this - with greater implications - was Felipe Nasr, who bagged P9 and more importantly two points. It means Sauber vaults Manor in the constructors' table. Most importantly it means for his team all of the money that comes with this. Some put it at $30m. The rest of the points scorers made impressive recoveries of their own. Nico Hulkenberg finished P7 and looked in aggressive form throughout, as he has pretty consistently recently as well as befitting one with a good record here, particularly when it rains. In his case he got a puncture today and more regrettably just after one of the restarts, sinking him to P15. He likely would have been in the mix for P3 without it. Still, his result combined with Checo's all but confirms Force India's fourth place in the constructors' table. Daniel Ricciardo got P8 after being similarly impeded by Red Bull's desire to roll the dice, while Fernando Alonso completed the scorers after a fine recovery of his own. He was there or thereabouts throughout but spun after the final resumption of green flag racing with 15 laps left, leaving him last. Having charged back he deprived Esteban Ocon - another to drive well - of a point on the penultimate lap. It's worth reflecting too rather extraordinary scenes for Felipe Massa's final home bow after his race also ended early. It reflected that few others in the paddock have or will command his level of affection. Sometimes this sport does get it right. These days it gets it right too, one way or another, in keeping the championship fight alive until the final race - someone worked out that this will be the seventh time in the last 11 we've got that. But it remains the case that whatever is thrown at him, and today it was a lot, Nico somehow retains his grasp of the aces. One would have to ask if Verstappen's rain performance was like the best of this century, along with Alonso in Hungary/06? It's a very good shout for it. Though the likes of Lewis in Silverstone '08, Vettel in Monza '08, Button in Canada '11 will have their advocates too. Maybe even Lewis in this one has a case?